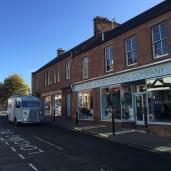 We are a unique destination retail concept – Books, Café, Deli & Home, based in the rural Scottish Borders. The shop is a haven for booklovers and foodies, focusing on quality products, customer experience, staff knowledge & passion. We are a very family & tourist-friendly space with extensive customer parking and free nappies in our toilets! Ten years on, the shop has gained a wonderful, loyal customer base, with new people coming through the doors every day. Many of the latter are attracted by our lively events programme, over the years, these have included Margaret Atwood, Michael Palin, Alexander McCall Smith, Maggie O'Farrell and Michael Morpurgo among many others.